On May 1, the Department of Health & Human Services (HHS) released a comprehensive analysis of enrollments made through the new Individual Health Insurance Marketplaces during the first open enrollment period (October 1, 2013, and March 31, 2014), as well as during special election periods through April 19, 2014. 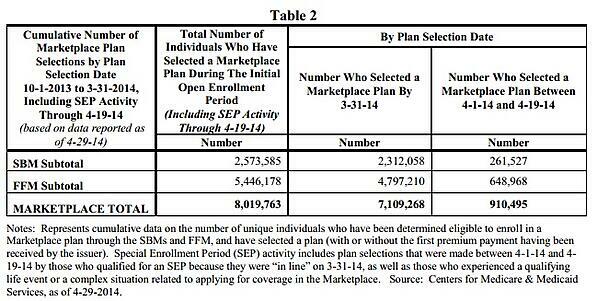 According to the HHS report, over 8 million people (8,019,763) selected a plan through the Health Insurance Marketplaces. This includes individuals who signed up through a State-Based Marketplace (SBM) and the Federally-Facilitated Marketplace (FFM). 2.2 million (28%) of the people who selected a Marketplace plan during the initial open enrollment period were young adults between the ages of 18 and 34. A total of 2.7 million (34%) were between the ages of 0 and 34. Nearly 3.8 million people selected a Marketplace plan during the March enrollment "surge" at the end of the initial open enrollment period. About 63% were white, compared to 17% African American, 11% Latino, and 8% Asian. 54% were female and 46% were male. 65% selected a Silver plan and 20% selected a Bronze plan. 85% were eligible for a premium tax credit. Over the course of the initial open enrollment period, the Marketplaces had 98 million website visits and 33 million calls to the call centers. The report also provided insight on how many of the 8 million were previously uninsured and how many of them were switching to new exchange-based individual health insurance coverage. The report predicts about 5.18 million people who applied for exchange-based coverage were getting coverage for the first time. This number is based on data showing that just 13% of new enrollees told the federal exchange that they had coverage at the time of the application. However, HHS cautioned that the sample used to make this calculation was small and people may have under-reported their coverage. Additionally, data for all the state exchanges wasn’t available. According to the report, CMS does not yet have comprehensive and accurate data about effectuated enrollment (the number of individuals who gained coverage through payment of the first premium). However, some issuers have made public statements indicating that 80% to 90% of the people who have selected a Marketplace plan have made premium payments.